10 ST | January 2019 www.sea-technology.com AnnualReview &Forecast For the 53rd year, leaders in ocean technology, research, business and policy give their perspectives on promising new developments and critical changes in ocean governance. 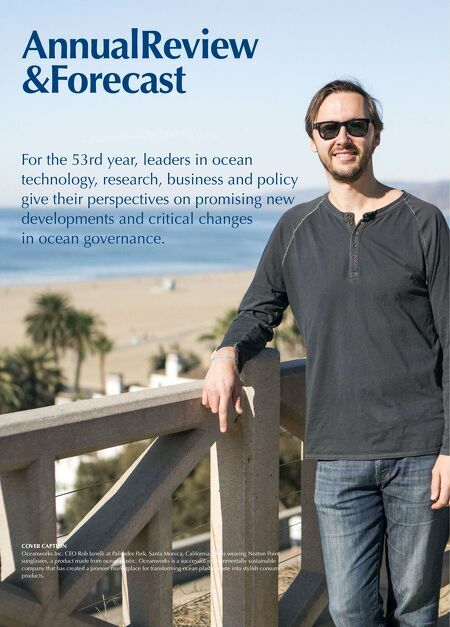 COVER CAPTION Oceanworks Inc. CEO Rob Ianelli at Palisades Park, Santa Monica, California. He is wearing Norton Point sunglasses, a product made from ocean plastic. Oceanworks is a successful environmentally sustainable company that has created a pioneer marketplace for transforming ocean plastic waste into stylish consumer products.